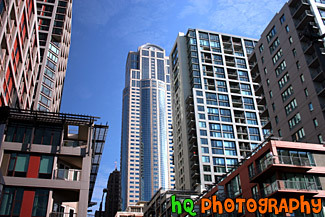 #1200 — A scenic picture looking up at tall buildings located in dowtown Seattle, Washington with blue sky seen above. #444 — A close up picture of the very tip of the Seattle Space Needle located in Washington State. This photo was taken from Queen Anne Hill overlooking the city. 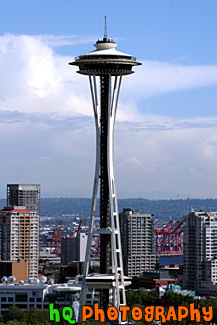 The 605 foot (184 meter) Space Needle was designed by Edward E. Carlson for the 1962 World's Fair in Seattle. The futuristic structure has become a symbol for the city, and is home to festive events such as the annual New Year's Eve fireworks display. #443 — A scenic picture of all the tall buildings and city of Seattle, Washington. The City of Seattle is located in the State of Washington on Puget Sound which is 113 miles (182 km) south of the U.S.-Canadian border. The city is located at sea level. The highest hill elevation in the city is 520 feet. Greater Seattle excels in livability with a mild climate, affordable housing, a full range of arts, cultural and sporting events, an abundance of shops and restaurants, and easy access to outdoor recreational activities throughout the year. 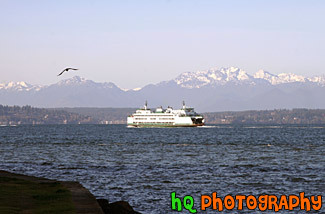 #1428 — A scenic picture taken of a Seattle ferry boat, a bird flying and the Olympic Mountains see in the background on this sunny day in Washington state. 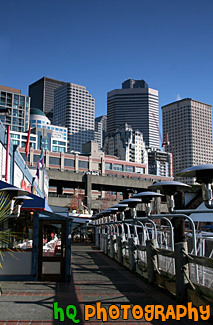 #1203 — A scenic picture looking at the tall Seattle buildings on a beautiful sunny day from a pier located by the water. This photo was taken on a blue sky, cloud free day. 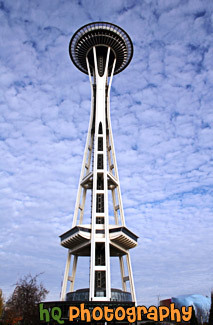 #826 — A scenic picture looking up at the Seattle Space Needle with an interesting clouds and blue sky background. 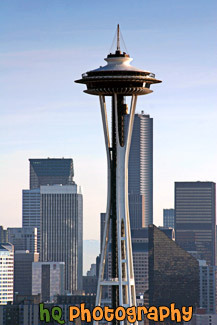 The space needle has become the symbol of Seattle as well as one of the symbols of Washington State. 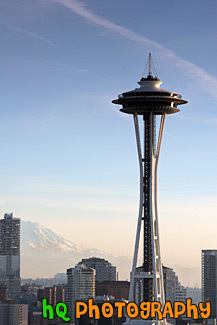 The Space Needle is 605 feet tall (184 meter) and was designed by Edward E. Carlson for the 1962 World's Fair in Seattle. 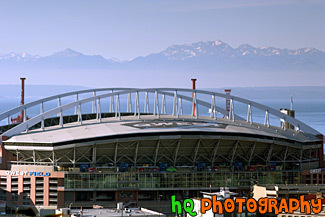 #817 — A close up picture taken of the Seattle Seahawk's Qwest Field with the snow capped Olympic Mountains and the sound in view in the background. This is the field in which the Seahawks play their home football games. Qwest Field has a 67,000 seat with over 70 percent of the roof being covered for the fans. #814 — A scenic picture taken at the famous Pike Place Market or the Public Market Center (farmer's market) in downtown Seattle, Washington. The is the place of the famous fish throwing, and where many people can be seen walking up and down the streets on a daily basis. 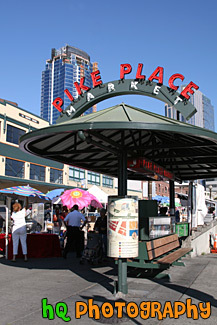 Pike Place Market is one of the oldest continuously operating public markets in the country. 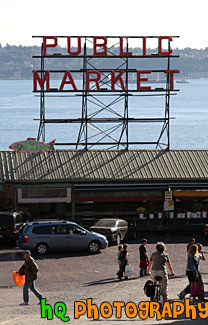 Pike Place contains a jumble of fish, produce and flower stalls and not to mention craft shops. 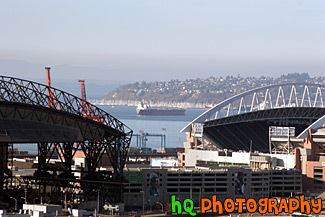 #808 — A scenic close up picture taken of the Seattle Seahawks Quest Field. This is the field in which the Seahawks play their home football games. Qwest Field has a 67,000 seat capacity, with 5,000 additional seats available for special events, and 1,400 seats for fans with disabilities. With a roof covering 70 percent of the seating area, fans will enjoy wide, comfortable seats with sideline seating a mere 52 feet from the playing field and end-zone seats just 40 feet from the action. The facility also features a dozen elevators and expansive concourses with an ample provision of concessions stands and restrooms. 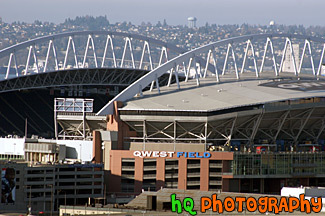 On June 2nd, 2004, the Seahawks announced a new stadium sponsorship agreement with Qwest Communications International Inc., with the stadium to be named "Qwest Field." #122 — A view of all of Seattle, Washington from across the water near Alki Beach. In this photo you can see a sail boat passing by Seattle. 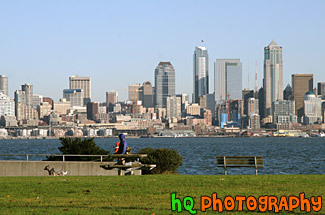 #121 — A scenic picture taken from across the water on Alki Beach looking the tall buildings of Seattle, Washington. 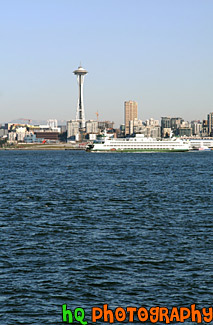 #825 — A scenic close up picture taken of a Seattle ferry boat in the Puget Sound. This ferry boat is leaving the shore. 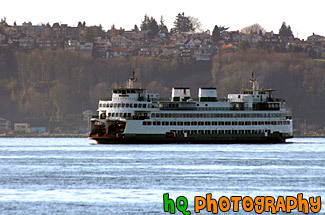 Washington State Ferries operates the largest ferry fleet in the United States. Twenty-eight ferries cross Puget Sound and its inland waterways, carrying over 26 million passengers to 20 different ports of call. From Tacoma, Washington, to Sidney, British Columbia, they travel up and down the Sound, acting as a marine highway for commercial users, tourists and daily commuters alike. #816 — A scenic vertical picture taken of the Seattle Space Needle and the Seattle skyscraper buildings behind it on a sunny day with blue skies. This picture is taken from the top of Queen Anne Hill where from this point you can see the entire city of Seattle, the Olympic Mountains, the sound, the Cascades, and Mount Rainier when it is actually "out." 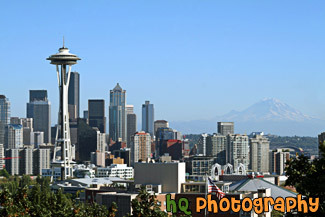 #822 — A scenic picture of the entire city of Seattle with the Space Needle and Mount Rainier seen in the distance. 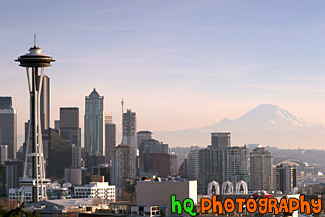 This picture shows the Seattle skyline on a beautiful sunny afternoon. You can also see Safeco Field in the distance. #1296 — A scenic picture taken of the Seattle skyline at dusk. 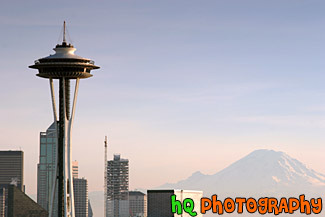 Seen in this photo is downtown Seattle, the Space Needle, and Mt. Rainier in the background. #810 — A scenic picture taken close up of the famous Seattle Space Needle with the tall skyscrapers of Seatle shown in the background. 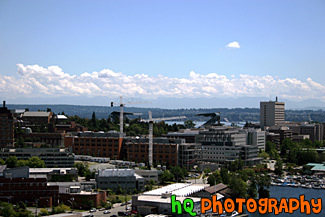 This picture was taken from Queen Anne Hill. 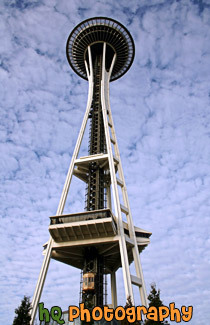 The Space Needle is 605 feet tall (184 meter) and was designed by Edward E. Carlson for the 1962 World's Fair in Seattle. 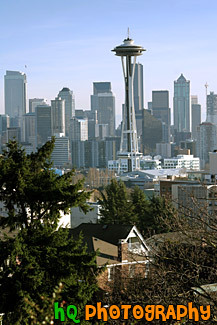 The Space Needle has become the symbol for the city of Seattle as well as Washington State. #412 — A scenic picture taken of the Seattle Space Needle in downtown Seattle, Washington. 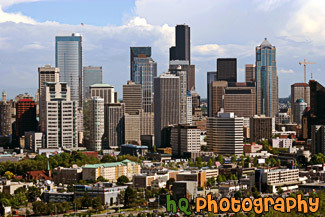 This photo was taken from Queen Anne Hill overlooking the city. 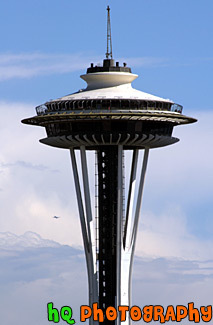 The 605 foot (184 meter) Space Needle was designed by Edward E. Carlson for the 1962 World's Fair in Seattle. The futuristic structure has become a symbol for the city, and is home to festive events such as the annual New Year's Eve fireworks display. #1930 — A scenic vertical picture taken of the Seattle Space Needle with Mt. Rainier seen in the background off to the left behind the Seattle skyscrapers. #1297 — A scenic picture taken close up of the Seattle Space Needle and Mt. Rainier seen in the background at dusk as you can see the color of the sky starting to change. 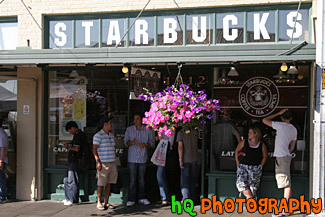 #812 — A scenic picture taken of the original Starbucks located at the Pike Place Market in downtown Seattle, Washington. As you can see in the picture there are guitarist outside the shop playing music and all kinds of people stopping to watch. 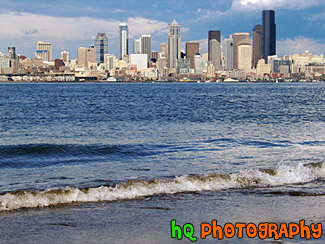 #120 — A scenic picture taken across the water on the shore of Alki Beach looking at Seattle, Washington. Waves from the Puget Sound are in the foreground. 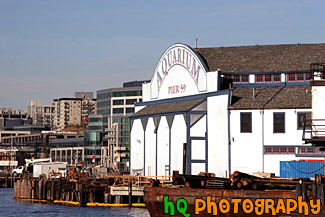 #820 — A close up scenic picture taken of the Aquarium Pier 59 building on the Seattle waterfront with blue sky in the background. The Seattle Aquarium offers fun and exciting ways to discover more about the amazing Puget Sound! The Seattle Aquarium is an awesome experience to see sea and river otters, seals, spectacular and amazing fish and more. #858 — A scenic close up picture taken of one of the many fruit stands located at the popular Pike Place Market in downtown Seattle, Washington. Bananas, melons, pineapples, oranges, apples, pears, and pomegranates can all be seen in this photo. 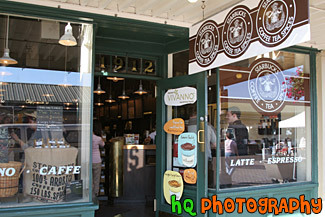 #1661 — A scenic close up picture taken of the original Starbucks coffee shop located in downtown Seattle, Washington. 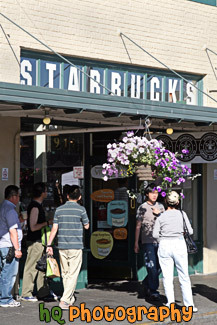 The Starbucks is located on 1912 Pike Street. 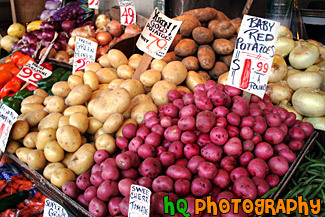 #897 — A close up picture take of a potato stand located at Pike Place Market in downtown Seattle, Washington. 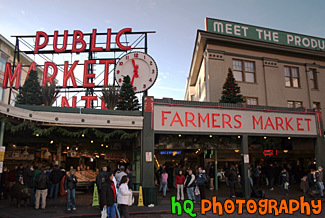 Pike Place Market is a popular farmer's market in Seattle in which all kinda of items are sold. 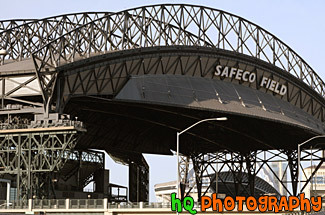 #1185 — A close up vertical photo taken of the Safeco Field building in Seattle, Washington. This is where the Seattle Mariners play baseball. 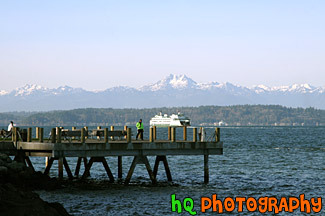 #1433 — A scenic picture taken of a dock, a Seattle ferry boat, and the Olympic Mountains seen in the background with snow-capped tops. This picture was taken on a chilly, sunny day in Washington state. 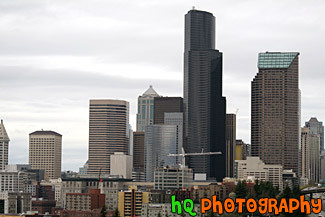 #1194 — A scenic picture taken of the tall buildings of downtown Seattle, Washington on a cloudy, overcast day. This is what the typical weather is like in Seattle. 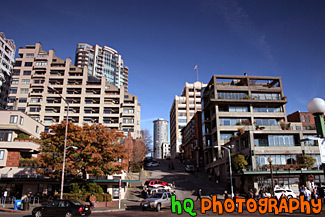 #807 — A scenic picture taken of the streets and buildings near Pike Place Market in downtown Seattle, Washington on a beatiful sunny day. 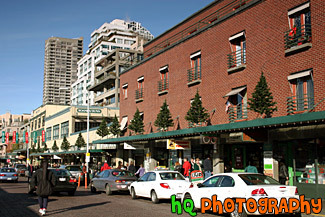 In this picture you can see the many people wandering the streets and sidewalk as it is a common occurance at Pike Place Market. 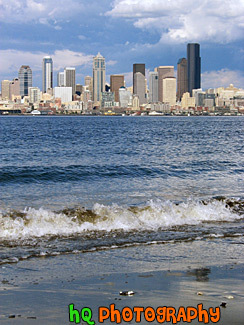 #132 — A scenic picture taken across the Puget Sound on Alki Beach looking at Seattle, Washington and the Space Needle. In this scenic photo you can see a Seattle ferry boat in the water in front of the Space Needle. 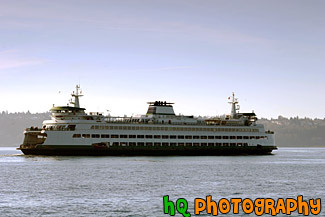 #926 — A scenic picture taken of a Seattle ferry boat located in the waters of Puget Sound. This ferry is about to come to shore to drop off its passengers at the Seattle port. 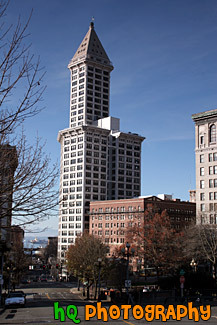 #877 — A scenic picture taken close up of Fisher Plaza which is located right across the street from the Space Needle and Seattle Center. 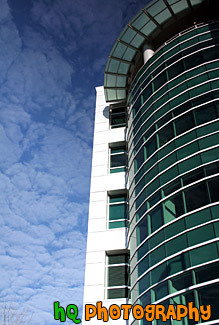 Fisher Plaza is a dynamic business community with extraordinary resources and capabilities from access to high-speed Internet options, satellite capabilities, videoconferencing, studio facilities and a vast array of media, technology and production services. 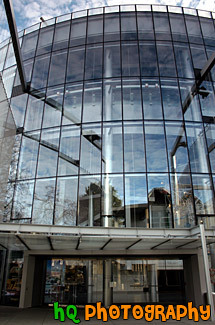 Fisher Plaza is home to KOMO 4 Television and KOMO 4 News. 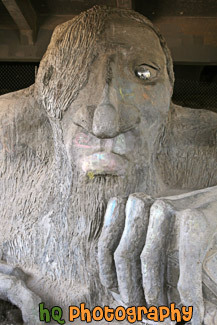 #2321 — A close up vertical picture taken of the Fremont Troll sculpture seen under the Fremont Bridge in Seattle, Washington. 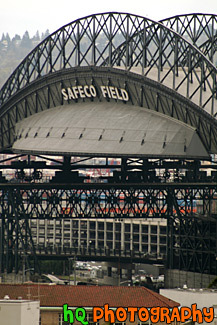 #1443 — A close up picture taken of the front of the Safeco Field building where the Mariners play their baseball games. #845 — A scenic picture taken looking towards the front or entrence to the Seattle Space Needle. The Space Needle is located at the Seattle Center right across the street from the KOMO News 4 building. This picture was taken with a beautiful sky background with blue sky and patchy clouds. #813 — A scenic picture taken of a bunch of fruit and vegetables for sale located at the busy Pike Place Market in downtown Seattle, Washington. Pike Place has been a popular craft and produce market since 1907 where tons of people are constantly walking up and down the streets checking out all the markets. #790 — A scenic picture taken of the University of Washington's Husky Stadium which is situated on Lake Washington just outside of downtown Seattle. In this picture you can see the water of Lake Washington along with the cascade mountains in the background. Husky Stadium was built in 1920 and seats 72,500 fans. Almost all of the seats are along the sidelines and offer an excellent view of the field. Many seats also contain a wonderful view of Lake Washington as well. The Husky basketball team plays next to Husky Stadium at Bank of America Hec Edmundson Pavilion. 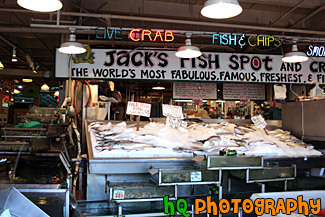 #859 — A scenic picture taken of Jack's Fish Spot and Crabs located in downtown Seattle, Washington at the famous Pike Place Market. Many people come here everyday to sight see along with buy from the farmer's markets. #1937 — A scenic picture taken of the Key Arena located at the Seattle Center in Seattle, Washington. This picture was taken of a sunny blue sky winter day. 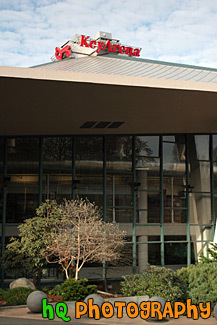 The Key Arena is home to Seattle's Storm and Thunderbirds. It also hosts entertainments most acclaimed talent from music's biggest stars to popular family shows. It opened in 1995. #1928 — A scenic vertical close up picture taken of the Key Arena located in downtown Seattle, Washington at the Seattle Center. 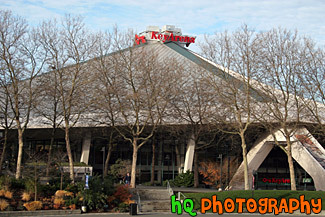 The Key Arena is the facility that the Seattle SuperSonics used to play in. #33 — A scenic photo taken of a man walking his dog and carrying his child along Alki Beach, which is located across from the Puget Sound and Seattle. 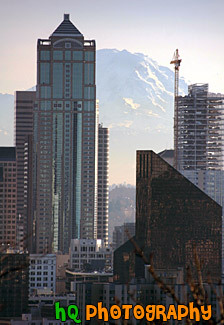 You can see the tall buildings of Seattle in the background on this sunny winter day. #823 — A vertical close up picture taken of the Marion Oliver McCaw Hall taken during the daytime. McCaw Hall is located in the Seattle Center near the Key Arena and Mercer Arena and down the block from the Space Needle. Marion Oliver McCaw Hall opened on June 28, 2003. McCaw Hall includes a state-of-the-art 2,900-seat auditorium, a 400-seat Lecture Hall, a cafe, a luminous five-story serpentine glass Grand Lobby, and a 17,800-square-foot public plaza. McCaw Hall is the home to Pacific Northwest Ballet, Seattle Opera, community festivals and guest performers from around the world, plus weddings, conventions, receptions, meetings and more! 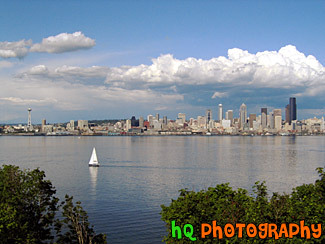 #931 — A scenic picture taken from Queen Anne Hill in Seattle looking at Mt. Rainier with some tall Seattle buildings in the foreground. This picture was taken close to dusk as you can see the color of the sky starting to change. #864 — A close up scenic picture taken of the Olympic Iliad sculpture located at the Seattle Center. 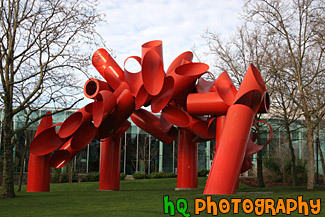 Alexander Liberman's Olympic Iliad is an orange-red painted steel sculpture which was installed in 1984 on the southwest lawn from the Space Needle in the Seattle Center's sculpture garden. The size is 45' high 60'wide and 30' deep. 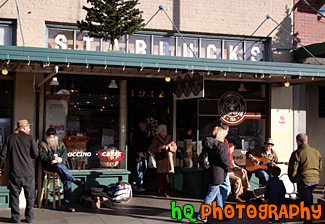 #1660 — A scenic picture taken of the original Starbucks coffee shop located near Pike Place in Seattle, Washington. This photo was taken during the summertime with flowers and people seen in front of the store. 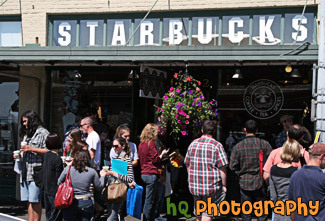 #2320 — A scenic close up picture taken of the Original Starbucks located at Pike Place Market in downtown Seattle, Washington. Tons of people are seen outside of the building as they are wanting to order coffee. #2151 — A scenic vertical picture taken outside of the original Starbucks building located near Pike Place Market in Seattle, Washington. #1202 — A scenic picture of people enjoying this beautiful day in Seattle, Washington along the waterfront on a sunny day. #1201 — A scenic picture of people out and about in downtown Seattle, Washington doing some holiday shopping around Christmas time. This photo was taken on a beautiful sunny, blue sky day in December. 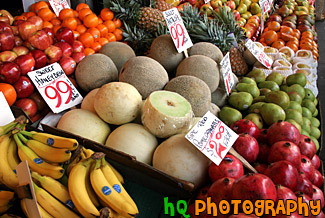 #860 — A close up scenic picture taken of one of the many fruit stands located at the Pike Place Market in downtown Seattle, Washington. 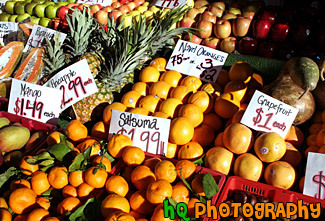 Some of the fruit in the photo includes oranges, apples, satsumas, mangos, grapefruit, and pineapples. #1662 — A scenic vertical picture taken of the Pike Place Market sign located in downtown Seattle on a blue sky sunny day. 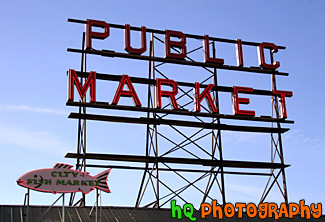 #1664 — A close up scenic photo taken of the Public Market sign located on a building at the Pike Place Market in downtown Seattle. The Puget Sound can be seen in the background. 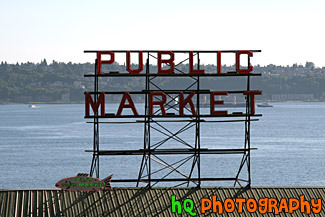 #815 — A close up picture taken of the Public Market and City Fish Market sign located on top of the building at Pike Place Market in downtown Seattle. 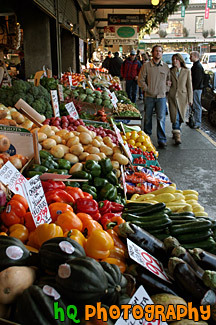 Pike Place Market is a popular gathering for farmer's markets and shops. #1665 — A scenic picture taken of downtown Seattle at Pike Place Market. 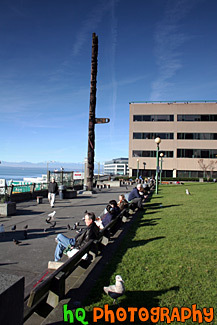 In this photo you seen the Public Market sign, people enjoying the sunny day, and the Puget Sound waters in the background. #2074 — A scenic picture taken of Qwest Field and the Puget Sound with a freeway seen in the foreground. 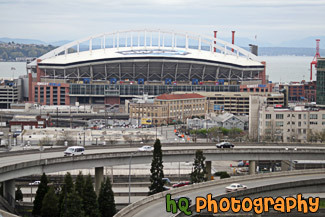 #2075 — A scenic close up picture taken of the Qwest Field football stadium for the Seattle Seahawks located in downtown Seattle. 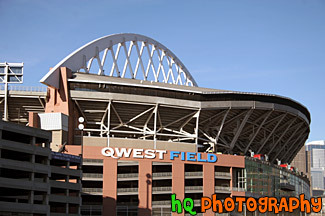 #1204 — A close up picture taken of Qwest Field located in downtown Seattle, Washington. 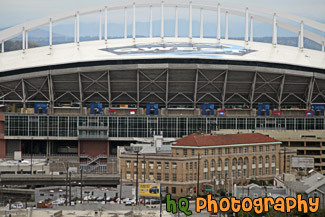 Qwest Field is the baseball stadium in which the Seattle Mariners play their games. This photo was taken on a sunny day. #856 — A scenic picture taken of a road leading towards the Puget Sound as you can see the water and a large boat near the shore. Also if you look closely you can see part of the Olympic Mountains in the very background. #809 — A scenic picture taken of the two Seattle professional sports stadiums side by side; the Seahawk's Quest Field and the Mariner's Safeco Field. In this picture you can see the Seattle sound in the background with a large boat in veiw. Safeco Field's playing surface is a custom designed state-of-the-art field. It features a specially designed drainage system and a custom blend of four kinds of Kentucky bluegrass and two kinds of perennial ryegrass to provide the optimal playing surface for the athletes, the retractable roof, and the Northwest climate. Qwest Field has a 67,000 seat capacity with a roof covering 70% of the seating area. 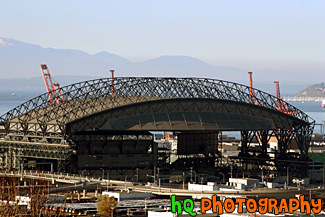 #818 — A close up picture taken of the Seattle Mariner's Safeco Field on a sunny day. In the background you can see the water of the sound and the Olympic Mountains in the distance. Safeco Field is home to the Mariners and Safeco Field's playing surface is a custom designed state-of-the-art field. It features a specially designed drainage system and a custom blend of four kinds of Kentucky bluegrass and two kinds of perennial rye grass to provide the optimal playing surface for the athletes, the retractable roof, and the Northwest climate.